It's important (and useful!) to send as few bytes of CSS and JS and HTML markup down the wire as possible. It's not just about size, though, it's also about the number of requests to get the bits. In fact, that's often more of a problem then file size. First, go run YSlow on your site. Seems that speeding things up is not just about making things smaller, but also asking for fewer things and getting more for the asking. I want to make fewer request that may have larger payloads, but then those payloads will be minified and then compressed with GZip. Or like this, and it still works. And some of these integrate nicely into your development workflow. You can put them in your build files, or minify things on the fly. YUICompressor - .NET Port that can compress on the fly or at build time. Also on NuGet. AjaxMin - Has MSBuild tasks and can be integrated into your project's build. SquishIt - Used at runtime in your ASP.NET applications' views and does magic at runtime. UPDATE: Cassette by Andrew Davey - Does it all, compiles CoffeeScript, script combining, smart about debug- and release-time. workflow - does it fit into your life and how you work? For me, I have a template language in my blog and I need to compress my CSS and JS when I deploy my new template. A batch file and command line utility works nicely so I used AjaxMin (yes, it's made by Microsoft, but it did exactly what I needed.) I created a simple batch file that took the pile of JS from the top of my blog and the pile from the bottom and created a .header.js and a .footer.js. I also squished all the CSS, including my plugins that needed CSS, and put them in one file while being sure to maintain file order. I've split these lines up for readability only. That also turned 22 HTTP requests into 3. Use JPEGs for photos of people, things that are visually "busy"
Use PNGs for charts, screenshots, things that must be "crystal clear"
I can also optimize the size of my PNGs (did you know you can do that!) before I upload them with PNGOUT. 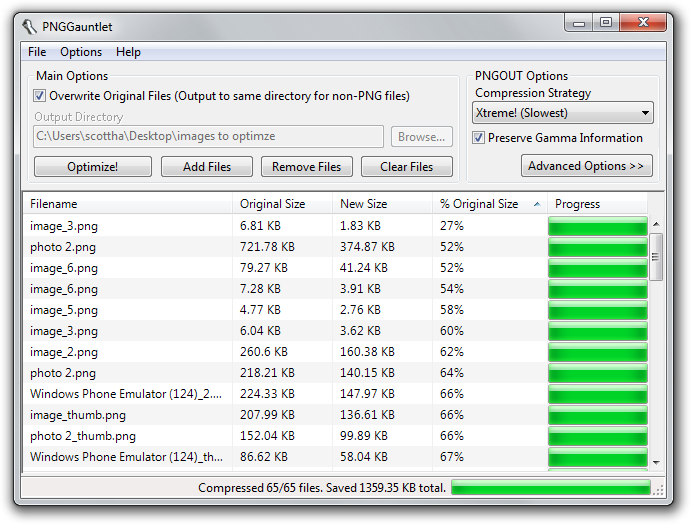 For bloggers and for ease I recommend PNGGauntlet, which is a Windows app that calls PNGOut for you. Easier than PowerShell, although I do that also. If you use Visual Studio 2010, you can use Mad's Beta Image Optimizer Extension that will let you optimize images directly from Visual Studio. To show you how useful this is, I downloaded the images from the last month or so of posts on this blog totaling 7.29MB and then ran them through PNGOut via PNGGauntlet. Then I took a few of the PNGs that were too large and saved them as JPGs. All in all, I saved 1359k (that's almost a meg and a half or almost 20%) for minimal extra work. If you think this kind of optimization is a bad idea, or boring or a waste of time, think about the multipliers. You're saving (or I am) a meg and a half of image downloads, thousands of times. When you're dead and gone your blog will still be saving bytes for your readers! ;) This is important not just because saving bandwidth is nice, but because perception of speed is important. Give the browser less work to do, especially if, like me, almost 10% of your users are mobile. Don't make these little phones work harder than they need to and remember that not everyone has an unlimited data plan. Mads reminded me about this great tip for IIS7 that tells the webserver to set the "Expires" header to a far future date, effectively telling the browser to cache things forever. What's nice about this is that if you or your host is using IIS7, you can change this setting yourself from web.config and don't need to touch IIS settings. You might think this is insane. This is, in fact, insane. Insane like a fox. I built the website so I want control. I version my CSS and JS files in the filename. Others use QueryStrings with versions and some use hashes. The point is are YOU in control or are you just letting caching happen? Even if you don't use this tip, know how and why things are cached and how you can control it. Make sure everything is GZip'ed as it goes out of your Web Server. This is also easy with IIS7 and allowed me to get rid of some old 3rd party libraries. All these settings are in system.webServer. I still have a "D" on YSlow, but a D is a passing grade. ;) Enjoy, and leave your tips, and your "duh!" in the comments, Dear Reader. Also, read anything by Steve Souders. He wrote YSlow.